Hi guys, before saying something about this unique tool, I would like to share with you a little bit information about LG Electronics who manufacture android smartphones and tablets for its end users. LG Electronics Inc is South Korean multinational electronics Company, having its headquarters in Seoul, South Korea. LG electronics manufactures a wide range of smartphones and tablet devices. Other than the G3, LG released the curved smartphone, G flex on 2013. First this gadget was release in South Korea in November 2013 and later it was announced to release in Europe, the rest of Asia and North America. Free download link for this software is shared below. Among all the fabulous phone types, the old and basic phone manufactures seem to be remembered by the people forever due the phones stability and durability and of course of the best quality. For example Motorola and LG still secure their position in people's heart due to their best quality products. LG's phones are quite stable and decent in shape and working. In other words, they are basically amazing. A wide variety of LG phones is available in mobile market at reasonable rates. In my this page, I have managed this unique tool which definitely will help you with your smart LG smartphone. This tool is so useful that once you install in on your LG phone, you will never want to not use it. It has built-in- features with new updates and recoveries. There are many many things this tool can do. For example this support tool will help you in reinstalling or flashing a firmware in your LG phone. You can update your server with from LG with innovative features with the help of LG mobile support tool or LG bridge. It enhances the performance of your android gadget and increases the value of your mobile with new features. Further more, it enhance the working capability of the phone to function correctly and actively. In addition, it saves backup in the background very quickly. Above all, in case, you shift to another android gadget or lose your data, it recovers all the data for you. LG Mobile Support Tool/LG Bridge acts as a bridge between your LG phone and your PC. It opens the way through which you can transfer your media files between your mobile and computer. Through this unique tool your LG mobile remains synchronized with your PC. This job makes it really easy manage files and media. It saves the LG phone from extra issues and makes easy for you to enjoy the latest updates. All of the updates can be installed on your phone without any delay. 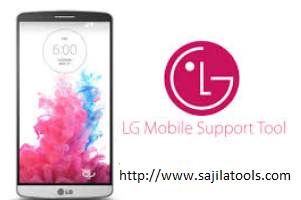 LG Mobile Support Tool/LG Bridge is completely free and also it is free of dangerous viruses. It has no harmful effects rather it benefits. If you wish to download this powerful tool for your android LG gadget, then just follow the link shared below and click on the link. Your download will start in a short period of time. Be patient so that the download would be completed in its due time. If the link is not working or showing errors then contact us via your comments in comments section. Your feedback would highly be appreciated and our technical will ready to help you any time.